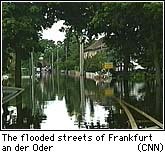 FRANKFURT AN DER ODER, Germany (CNN) -- Despite massive reinforcement efforts and sandbagging, a third dike along the Oder River gave way early Sunday, sending waters swirling up roof-high. 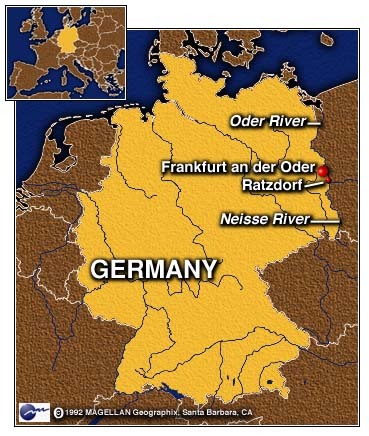 Local officials said at least another 67 people were evacuated as waters gushed through the approximately half-mile (1 km) breach south of the city Frankfurt an der Oder. The latest dike to crumble was near another river dike that broke last week near the village of Brieskow-Finkenheerd, just south of Frankfurt an der Oder. Thousands of people, including emergency teams of soldiers, border guards and volunteers, were working around the clock as part of efforts to shore up other flood barriers along the river. Floodwaters appear to have stabilized in some areas but are said to still be at critical levels. Officials said the situation in Ratzdorf, upstream at the confluence of the Oder and Neisse rivers, was stable. 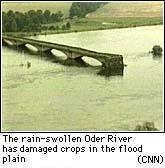 However, there is still the threat that central Europe's worst flood this century might inundate Germany's fertile Oderbruch plains, north of Frankfurt an der Oder. Several villages were flooded a few days ago when the 100 mile (160 km) long dike broke south of Frankfurt an der Oder. To the north, about 5,000 people were evacuated as a precaution from low-lying areas south and east of Bad Freienwalde, near the Polish border, on Friday. As people were ordered to leave their homes in the most affected areas, farmers began moving thousands of head of livestock to higher ground. The evacuations triggered fears of possible looting, and in the early stages of the flooding many people decided to stay behind, hoping for the best. Interior Minister Manfred Kanther sought to ease homeowners' fears and said that police would protect the evacuated villages. The severe flooding killed about 100 people in neighboring Poland and Czech Republic. About a third of the 1.6 million acres flooded in Poland were still under water, a government spokesman said. About 50,000 Poles have been evacuated from their homes in recent days. Polish villagers complained that food, medicine, clothes and other aid had been distributed unjustly and that the police were not doing enough to stop looting in the flooded areas. Correspondent Betsy Aaron and Reuters contributed to this report.